I don’t always need a full Linux VM running when all I want to do is ping or traceroute between two hosts on the network, this is where Virtual PC Simulator (VPCS) comes into play. VPCS is a lightweight PC simulator that has a basic set of network commands such as ping, traceroute and telnet. It does not consume the CPU and memory resources that adding another router or VM would use. VPCS can simulate up to 9 separate PC at a time. load [filename] Load the configuration/script from the file [filename] (startup.vpc is the default filename). save [filename] Save the configuration to the file [filename] (startup.vpc is the default filename). show [arguments] Print the information of VPCs (default). Try show ? Now you will be able to drag a VPCS host into you topology and use it to run simple ping and traceroute tests. 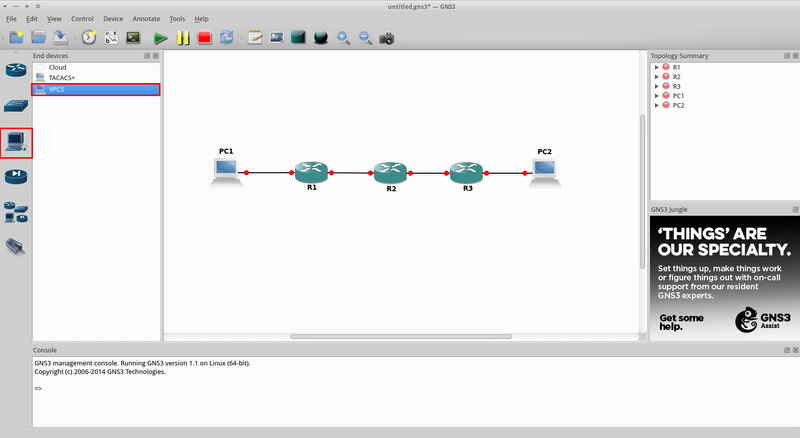 In the following example I will use a simple OSPF network and two VPCS hosts to demonstrate.
! router ospf 1 network 0.0.0.0 255.255.255.255 area 0 ! Perfect everything is working as expected, now you can use VPCS for simple connectivity tests in you topology without having the burden of running a VM. I hope this has been helpful and as always please let me know in the comments section if you find any problems in the post. Yea, got it up now. I forgot I stopped due to lack of IOU. Thanks! Hey… I have L3 and L2 up. Is L3 sufficient as and what’s your solution for switch. Also, have you thought about doing a guide on the explanation and or step by step way to set it up. @Genius, not sure I understand what you mean “my solution for a switch”? The IOU L2 images provide the Layer 2 switching features that you would require for doing your CCNA or CNNP switch exams. With regards to setting up the devices keep an eye on the blog because over the coming weeks there will be quite a few posts covering the topics in the ICND 2 exam.